If there is something that enhances Antequera, it is its monuments and historical heritage. And this has been so since the Prehistory (Dolmens), Antiquity (Roman villas and remains), Middle Age (Muslin Citadel), Modern Age (the original Renaissance style Santa María La Mayor Royal Collegiate and the rest of temples where the Baroque reaches its utmost expression, such as the El Carmen Church) or even since the very own Contemporary Age (with many Mansions and civil buildings, such as the Torcal Theatre, one of the maximum representation of Art Deco in our autonomous community). However, there is no doubt that what really distinguish Antequera are its 33 churches, being the city with more churches per habitant. The privilege geographical location of Antequera, -link between Granada and Seville, and between Córdoba and Málaga- turned the town into a prolific place regarding the Religious Orders. This directly resulted in a proliferation of Christian temples which, beyond its real religious vocation, are at the same time real works of art forming a heritage of incalculable value. That is the reason why the Antequera Town Hall, in collaboration with the Holy Week Association of Brotherhoods and Fraternities, has recently established an agreement to proceed to the massive opening of the temples. This will be another attraction for tourists and, at the same time, it will help to collaborate in the maintenance of those buildings and, if appropriate, of the Brotherhoods and Fraternities guarding them. Thus, the Tourist Department promotes one of the greatest heritage treasuries of the town which, until now, has not properly been taken into account when spreading the touristic, cultural and monument heritage. The temples directly joining this initiative, by the fact of belonging to the Brotherhood Association, are the churches of San Agustín, San Francisco, Trinidad, San Sebastián, San Pedro, Belén, Santo Domingo, Santa María de Jesús and El Carmen. All of them will open on Saturday morning, plus their respective opening times during the week. Among the actions in parallel included in the initiative, it is the free entry to the churches and to the Fraternities Brotherhood House, visits guided by volunteers belonging to the mentioned Fraternities, route circuits to the Fraternities, arranged visits for groups, informative brochures, specific information in the webpage of the Fraternities Association (http://www.agrupaciondecofradiasdeantequera.org) and explanation of the pieces and altarpieces in the temples so visitors can get a better understanding. Because of the creation of the programme “Antequera, the City of Churches”, the Tourist Department of the Antequera Town Hall has created a promotional identifier. It is an image that evokes the highest part of the Renaissance main façade of “the church of the Antequera’s churches”: Santa María la Mayor Royal Collegiate, and which reproduces the particular shape of this Collegiate pinnacles. 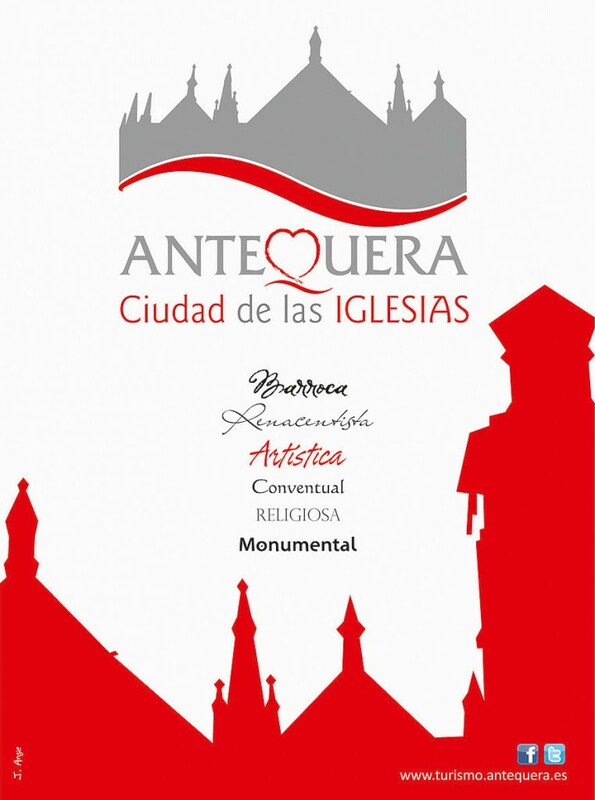 This identifier image also maintains the corporative colours of the promotional brand of the town “Antequera, Directly to your heart” by reproducing the same elements.